Walking, riding, cycling, Go Ape …The Wyre Forest offers miles of excellent opportunities for outdoor events. The Wyre Forest visitor centre is just a 10 minute walk from the Country Inn. West Midland Safari Park is home to some of the world's most beautiful and endangered exotic animal species. 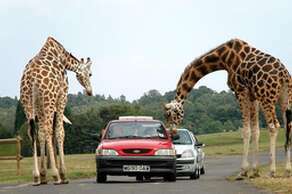 Safari Drive-Through, adventure theme park, children’s playground and more. 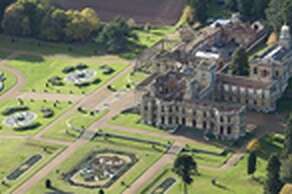 Explore the dramatic ruins of Witley Court and travel back to a world of lavish house parties. Learn the stories behind the people who once lived and partied there, from servants to royal visitors. Discover elaborate parterre gardens and monumental fountains then find your way through enchanting woodland to the unique adventure play area. Witley Court has something for everyone to enjoy. Things to do and see:A Romantic Ruin, Glorious Gardens, Wilderness Play Area, Woodland Walks and Great Witley Church. The Severn Valley Railway is a heritage railway in Shropshire and Worcestershire, England. The 16-mile (26 km) heritage line runs along the Severn Valley from Bridgnorth to Kidderminster, crossing the Shropshire/Worcestershire border, following the course of the River Severn for much of its route. Train services are hauled predominantly by steam locomotives;however, diesel traction is also sometimes used on designated days and during periods of high fire risk. 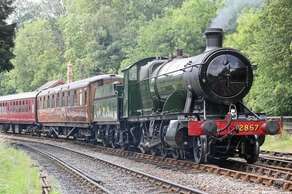 The railway is one of the most popular heritage railways in the country as well as being the sixth-longest standard gauge heritage line in the United Kingdom. It hosts numerous special events throughout the year, including both steam and diesel galas. Main train station:Kidderminster - DY10 1QX, Situated on Comberton Hill, the A448 Kidderminster - Bromsgrove road. Bewdley train station:DY12 1BG, Situated off Stourport Road. Follow the brown tourist signs from the Bewdley bypass, the A456 Kidderminster-Leominster road. Pay &display parking available at both stations. The Shelsley Walsh Speed Hill Climb is a hill climb in Worcestershire, England, organised by the Midland Automobile Club (MAC). 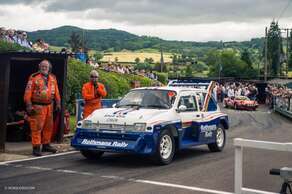 It is one of the oldest motorsport events in the world and is in fact the oldest to have been staged continuously (wartime excepted) on its original course, first having been run in 1905. On that first occasion, the course was 992 yards (907 m) in length, but in 1907 it was standardised at 1000 yards (914 m), the length it remains today. Shelsley Walsh is a notably steep course by the standards of today's hill climbs. It rises 328 feet (100 m) during its length, for an average gradient of 1 in 9.14 (10.9%), with the steepest section being as much as 1 in 6.24 (16%). Furnace Mill is a well-established fishery set in the heart of the Wyre Forest, providing a beautiful and peaceful setting for some of the best fishing in the Midlands. Furnace Mill Airgun Range offers taster sessions, airgun courses and shooting competitions. 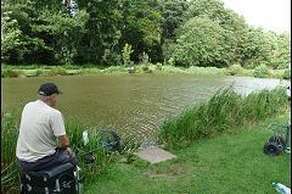 Furnace Mill Fishery offers a selection of four coarse pools stocked with good quality, well cared for fish. Individual pleasure fishing and/or group competitions are all possible. Go back in time and watch the Severn Valley Railway trains steam across the hill from one of the magnificent signposted walks. The garden provides the ideal day out for you and your family, a dream escape from the bustle of everyday life. The Arboretum offers plenty to do for all ages from the Italian garden with its fountain, to the Themed Trails and maze. Our Peacocks are also a splendid sight wandering around the gardens. A beautiful spot by the river, with plenty of open green space for the whole family to enjoy. But that is not all –there are many attractions and activities available by the river, including boats to hire for £14 –30 minutes (boats hold up to 6 people), a modern and exciting children’s play area, river cruises with the Stourport Steamer Co, crazy golf, a putting green, go-kart’s, a paddling pool, skateboard park, plus many amusements. The meadows also stage several big events throughout the year, visit the what’s on page to find out more. 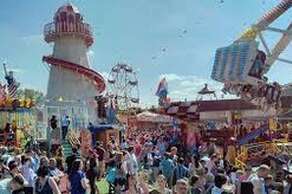 Just the other side of the bridge, by the river, you will find Treasure Island Amusement Centre –with 25 fairground rides, including the dragon roller coaster, dodgems, waltzers, a Ferris wheel, carousel, helter skelter and a large arcade, plus a range of food and drink available. Ludlow is a market town in Shropshire, England. 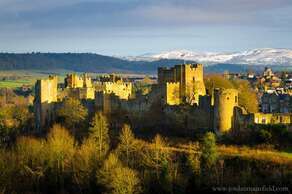 With a population of approximately 11,000, Ludlow is the largest town in south Shropshire. The town is significant in the history of the Welsh Marches and neighbouring Wales. The town is near the confluence of the rivers Corve and Teme. The oldest part is the medieval walled town, founded in the late 11th century after the Norman conquest of England. It is centred on a small hill which lies on the eastern bank of a bend of the River Teme. Atop this hill is Ludlow Castle and the parish church, St Laurence's, the largest in the county. From there the streets slope downward to the River Teme, and northward toward the River Corve. The town is in a sheltered spot beneath Mortimer Forest and the Clee Hills, which are clearly visible from the town. Ludlow has nearly 500 listed buildings, including examples of medieval and Tudor-style half-timbered buildings. The town was described by Sir John Betjeman as "probably the loveliest town in England". Bridgnorth is a town in Shropshire, England. The Severn Valley splits it into a High Town and Low Town, the upper town on the right bank and the lower on the left bank of the River Severn. Bridgnorth is home to a funicular railway that links the high and low towns, the Castle Hill Railway, which is the steepest and only inland railway of its type in England. 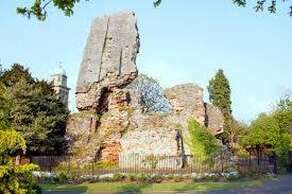 The ruins of Bridgnorth Castle, built in 1101, are present in the town. Due to damage caused during the English Civil War, the castle is inclined at an angle of 15 degrees. Bridgnorth is approx. 17 miles from here (30 min drive).